Added by Bill Bowman on February 21, 2019. Maria Patti passed away on Feb. 17 at her home in Somerset, surrounded by her loving family. Maria was born and raised in Ribera, Sicily, Italy where she met her husband of 54 years, Stefano. They married on February 3, 1965 and started a family before coming to the United States in 1971. Maria will be remembered as a kind and loving person and a devoted wife, mother, grandmother, aunt and sister. She is survived by her loving husband Stefano and their children Nello, Milena and her husband Anthony Marucci, Charles and his wife Francesca and Paulie and his wife Lina. She is also survived by her grandchildren Stephanie, Guiliana and Luca Marucci, Gianluca and Valentina. 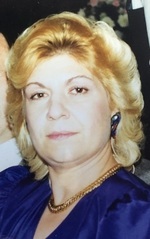 Other family members who survive her include her brother Guiseppe and his wife Nicoletta and her sister Enza and her husband Francesco Dinghile. Maria will be remembered as a wonderful cook who enjoyed nothing more than a good meal surrounded by her family and friends.